Incidentally, PPPs were among the legacies of the first Aquino administration. It was during the term of Noynoy’s mother, the late President Cory Aquino, that the first PPPs in the power generation sector were implemented. In 1987, she issued Executive Order (EO) No. 215 that allowed private corporations to construct and operate electric generating plants. (Read here) Cory’s privatization formed part of a wide-ranging package of structural reforms pushed by the International Monetary Fund (IMF) and the World Bank to supposedly address the country’s fiscal crisis in the late 1980s. 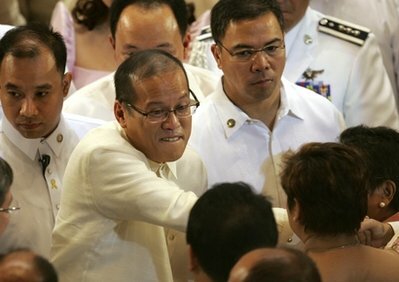 Meanwhile, together with transnational corporations (TNCs) and other foreign firms, the country’s richest families who are also perceived supporters of Aquino like the Lopezes, Ayalas, Cojuangcos and Pangilinans among others have been aggressively investing in PPP projects including in energy, water, toll roads and other vital infrastructures. Aquino said in his speech that he remains upbeat despite a budget of just 6.5 percent of the total with still six months remaining as private investors have expressed renewed interest and confidence in the Philippines. In fact, according to Aquino, one investor is proposing to construct an expressway connecting Manila and Cagayan Valley at no cost to the government. Another investor is proposing to lease the lands occupied by the Philippine Navy headquarters along Roxas Boulevard and its Naval Station in Fort Bonifacio, disclosed Aquino. The unnamed investor will foot the bill of the Navy’s transfer to Camp Aguinaldo, immediately pay US$100 million, and share a portion of profits from businesses it will establish on the leased lands. “Sa madali pong sabi”, said the President proudly, “makukuha natin ang kailangan natin, hindi tayo gagastos, kikita pa tayo”. Aquino identified the most pressing needs of the country as education, infrastructure and health, as well as the needs of police and military personnel. He described PPPs as a progressive and creative way to raise funds and address the country’s age-old problems. Like her son, Cory used the grim fiscal situation left behind by the Marcos dictatorship to justify her privatization/BOT program that was later expanded (in 1993) by the Ramos administration through RA 7718. (Read here) This legislation introduced other BOT schemes such as build-own-and-operate (BOO), build-lease-and-transfer (BLT), build-transfer-and-operate (BTO), contract-add-and operate (CAO), rehabilitate-operate-and-transfer (ROT) and rehabilitate-own-and-operate (ROO). These schemes allowed the biggest foreign and local corporations to invest in infrastructure development and operate or own strategic facilities that are “normally financed and operated by the public sector”. These facilities include power plants, highways, ports, airports, canals, dams, hydropower projects, water supply, irrigation, telecommunications, railroads and railways, transport systems, land reclamation projects, industrial estates or townships, housing, government buildings, tourism projects, markets, warehouses, solid waste management, information technology networks and database infrastructure, education and health facilities, sewerage, drainage, dredging and other infrastructure and development projects. Among the notable examples of and biggest PPP projects in the Philippines are the privatization of the National Power Corp. (Napocor) and the Metropolitan Waterworks and Sewerage System (MWSS). It is actually ironic that while championing the PPP, Aquino cited the P200-billion debt of Napocor from 2001 to 2004 as among the examples of wasteful and flawed programs of the Arroyo administration. Aquino claimed in his SONA speech that the state power firm’s debt ballooned because it was forced to sell cheap electricity at a loss presumably for electoral reasons. What Aquino did not mention was that Napocor’s financial bleeding was caused by PPP initiatives implemented by past administrations. Napocor’s debt soared as government assumed all the project risks related to building and operating a power plant in its rush to attract private investors. Thus, Napocor agreed to pay for 70-100 percent of generation capacity of independent power producers (IPPs) even if electricity is not actually produced (take-or-pay). The state power firm also consented to pick up the tab for the IPPs’ fuel needs (fuel-cost guarantee). Without these guarantees, private investors would not take interest in the country’s power sector which has a relatively small market. Similarly, while Aquino criticized the MWSS officials’ many abuses, including P160.1 million in questionable allowances and benefits, he did not mention that billions of pesos in taxpayers’ money had been used to save the failing privatization of water in Metro Manila. In 2004, Malacañang bailed out the Lopez family, one of Aquino’s perceived political patrons, to the tune of P8.3 billion by temporarily taking over the heavily indebted Maynilad Water Services Inc. The bailout was meant to preserve the integrity of the country’s water privatization program. In short, PPPs may provide immediate fiscal relief but actually burdensome in the long-term for the perennially bankrupt government. These types of projects are often heavily funded by foreign debt, including official development assistance (ODA) and require practically no equity from private contractors. Thus, while Aquino claimed in his SONA that government will not shell out a single peso in these PPPs, the reality is that government would assume the risk of the foreign debt and pass on the burden to the people through taxes. The private sector builds and operates roads, hospitals, utilities, etc. not out of altruism but out of expectation to earn profits. Thus, PPPs in infrastructure development often result in exorbitant user fees including tolls, fees, rentals, and other charges – burden shouldered by the people on top of paying taxes to government. Furthermore, starting next month, motorists plying the South Luzon Expressway (SLEX) will have to endure an increase of 233 percent in toll fees imposed by the private operator. (Read here) Power, water, toll roads are all charged with the onerous 12 percent value added tax (VAT) along with other basic commodities and services in the Philippines. In his SONA, Aquino also criticized the over-importation of rice by the National Food Authority (NFA). Before the SONA, Cabinet officials have announced that NFA rice subsidies would be scrapped because they are prone to pilferage and abuse. (Read here) These moves set the tone for the implementation of the longstanding plan to privatize the NFA, which the Department of Finance (DOF) said is in deep debt worth P125 billion. Note that corruption, mismanagement, and indebtedness were the same reasons used to justify the privatization of Napocor and MWSS. Aquino’s promotion of PPPs and privatization in his SONA has further reinforced the view that his administration is incapable of introducing new policies that will reverse the old pro-business, pro-market neoliberal policies of the past administrations, including the Arroyo administration. I agree with you. His answers to our problems leans towards neo-liberal policies that will only do good for big businesses and give nothing to those who are already marginalized. I wish he moved towards a more equitable solution. I was hoping he would lean towards development of agriculture, and move development to the rural poor and countryside. Neo-liberal policies are based on greed and selfishness, doing little for poverty or quality of life. It is an economy for the rich. If these policies were in place, our economic growth will once again be unfairly distributed.